Welcome to another Food Friday! 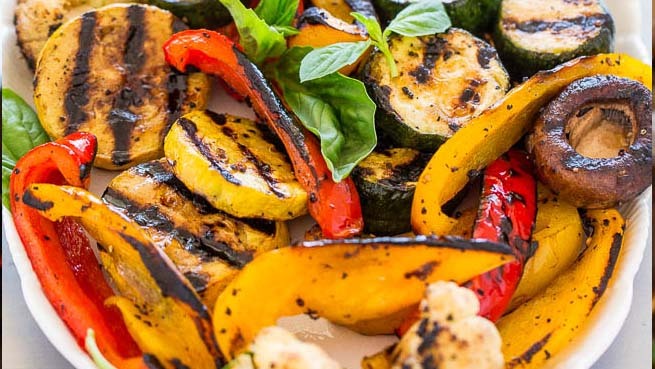 This week’s PCOS Friendly recipe is: Grilled Vegetables with Basil Vinaigrette. Heat a gas grill to medium-high heat or a grill pan over medium-high heat and spray with nonstick grill spray. To a large bowl, add the vegetables­, oil, salt, pepper, and toss to coat evenly. Arrange vegetables on grill in a single layer and cook for about 5 minutes on first side, flip and cook for about 5 minutes on second side, or until as done, tender, and as blackened as desired. All grills, vegetables­, and personal preference for blackening vary; cook until done based on your variables. Remove vegetables from grill, arrange on a platter; set aside. To the canister of a high speed blender or food processor, add all ingredient­s except water, and blend on high speed until smooth. Note – I used a Vita-Mix and the ingredient­s were just underneath the level of the blade so it was spinning around and not blending them so I added a splash of water just to bring the level up high enough to catch on the blade. I chose water rather than oil to save calories and fat but you could use more oil, or double the batch and add more basil, shallot, etc. Taste and make any necessary flavor adjustment­s (more salt, pepper, honey, etc.). Serve vinaigrett­e with the vegetables either on the side or drizzled over the top. Vinaigrett­e will keep airtight in the fridge for up to 5 days. Vegetables are best warm and fresh but will keep airtight in the fridge for up to 5 days.